A few years ago I decided to read through the entire Bible. I had never done it before – most people haven’t. In church the scripture readings come from the lectionary, which is a calendar outlining specific readings for specific seasons and days. It’s a sort of Bible Greatest Hits that ensures you’re always reading the passion during Holy Week and the nativity story at Christmas. The benefit of the lectionary is that it taps into a key concept in pedagogy: repetition. If something is important you don’t teach it once and assume your students have it. You say it over and over. And each time you talk about it you add something a bit different. The downside of using a lectionary is that we only focus on the parts of the Bible we find “most important,” and leave the rest for people to read outside of communal worship. I think the greatest thing I learned from reading the Bible all the way through is that the Bible is a really big book. There’s a lot in there. The sheer volume of words guarantees that no matter what you believe, there’s something in the Bible to support it. And a lot of it is just vague enough that you can take it as literally or as figuratively as you want. We sometimes criticize Christians for picking and choosing which parts of the Bible to follow, but after reading it my only conclusion was, “How could you not?” There’s just so much to take in, so much to interpret. Things that seemed to go together one day sound contradictory the next. Stories you discounted as foolish at first become your favorites (I used to hate Jonah and the Whale). But that’s also what I love about the Bible. It’s not easy. It makes me think and question and go over my own internal logic time and time again. Every new thing I learn in the world turns into a new way to read a particular story or passage. I’ve never been able to read a line of scripture and take it without question. For me, the question is the point of reading scripture. Reading the Bible brought up a lot of questions. It made me think a lot. There was one beautiful moment in my reading where I lost faith in God completely. I kept reading anyway, because it’s good to wrestle with your God from time to time. Some of us just love the fight. So Jonah ran away. He ran away because Nineveh scared him and the task scared him. He got on a boat and sailed in the opposite direction. But God caused a storm and Jonah ended up in the sea. In the sea a big fish swallowed him up. And in that moment, that sad, terrible, scary moment, Jonah realized he had to go back. He had to do what God asked him to do. He had to go to Nineveh. He had to tell a bunch of strangers that they were all going to die. Whether or not it comes from God, I believe we are all called to do things in this life. Maybe it’s making art or teaching children. Maybe it’s being a good father or telling the truth when it counts. These are things of substance and meaning, things that are difficult or scary, things we know must be done but we wish someone else would do them. And if we’re being honest with ourselves, we probably know what these things are. We know when the task before us is something we ought to do, something we are called to do. But denial is powerful, and so is fear. So we run. We run in the opposite direction of whatever that big important thing is. And we tell ourselves we’re doing right. That it doesn’t really need to be us to do that thing. We wouldn’t be any good at it anyway. But no matter how far or fast we run, that thing is still there. We know it’s there. And sometimes we find that running puts us in a place that is so much worse than we could have imagined. A dark place. A disappointing place. A place where we feel trapped. A place we know we were never supposed to be. If we’re lucky, the terror of this place will be powerful enough to combat the denial and fear and send us back in the right direction – send us back to do the work that we were always called to do. There is a big fish out there for all of us. It lurks in the deep. And if you let it, it will swallow you whole. Go and do the work you were meant to do. Religions don’t exist outside of society or in spite of society. They are society. What troubles one troubles the other. While my church has made all the necessary provisions to allow gender equality in the faith, it suffers from the same deep, unspoken, often subconscious bias that we all have in our daily secular lives. They call it the Stained Glass Ceiling. Despite equal numbers in lay participation and ever growing numbers in clergy, women still make up a noticeably small percentage of bishops. Of the approximately 300 members of the House of Bishops (which include both current and retired bishops), less than 20 are women. Almost 27 years after the ordination of pioneer and confirmed badass Barbara Harris as the first female bishop in the Anglican communion, we haven’t even hit 10%. 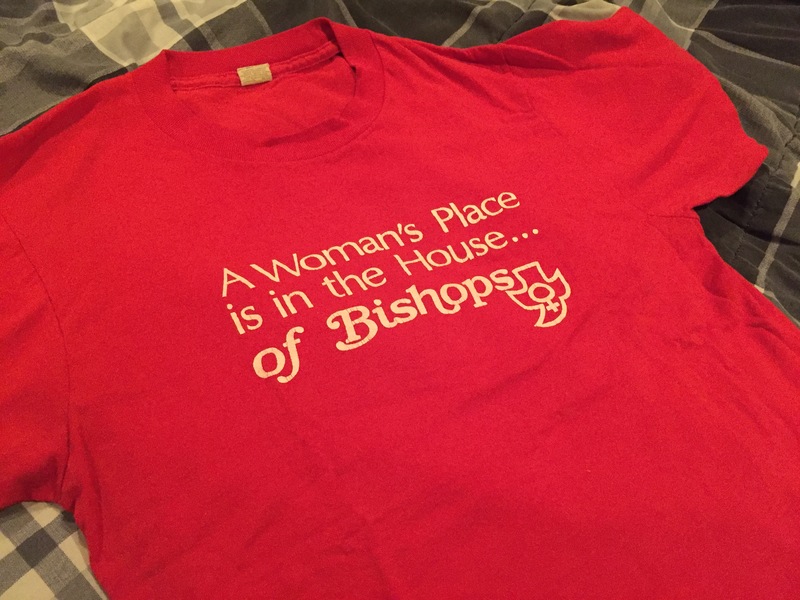 The sweet t-shirt I bought from the Episcopal Women’s Caucus booth at General Convention in 2006, the year the Most Reverend Katharine Jefferts-Schori was elected Presiding Bishop. The same internalized sexism that keeps people in strict gender roles in secular society also works in the church. Women don’t feel pushed or encouraged to go after positions of leadership and authority. When they become clergy, they are less likely to be called to a large congregation, which would be the kind of experience many are looking for when electing a bishop. So while few Episcopalians would suggest that there is anything wrong or different about women that make them unfit for the role of bishop, somewhere in the back of all our minds is a nagging voice that thinks the man is a more logical choice. The Church of England only started allowing female bishops in 2015, but there is a real and legitimate concern that they will quickly outpace the Episcopal Church. Why? Because in the Church of England bishops are appointed, not elected. It is easy to notice how many women you’ve chosen when you’re picking every bishop. But when individual dioceses are voting for their own leadership, no single diocese is to blame for once again choosing one of the male candidates over the female candidate. In theory, it is not the job of humans to pick bishops. Rather, we are supposed to recognize who God is calling and confirm that call. That’s why announcements for ordination say that the service will take place “God willing and the people consenting.” God does not, I assume, purposely call more men than women to the office of the bishop. Which means that we, unknowingly and unintentionally, are obstructing the will of God. This one is such a non-issue for me personally I normally wouldn’t even think to bring it up, but every once in a while some sensationalized news story crosses my feed and I feel the need to make myself clear. I have no problem with fictionalized representations of witches, the occult, the supernatural, or anything vaguely related to the trappings of paganism. I tend to be pretty into that kind of stuff. For reference, see my beloved X-Files DVD collection, lovely set of tarot cards, and “Ten Points for Hufflepuff” t-shirt. I have never actually met another Christian in real life who had a problem with fictionalized depictions of witchcraft. I’ve only seen such people in movies or read articles about them online. In theory the issue is that witchcraft is a form of pagan worship, and pagan ritual is evil. However fictional witches almost never bear any resemblance to actual pagans, and I don’t have any problems with pagans anyway. Most church traditions came out of pagan rituals. In fact as far as I know, the calendar of Christian holidays is based entirely on ancient pagan festivals and days we’re pretty sure saints died. There are a lot of church groups that like using magic and fantasy stories as discussion pieces, though it’s unlikely you’ll ever read a news story about a really lovely Lutheran Lord of the Rings reading group. But any narrative that asks you to consider themes of love, sacrifice, mercy, and compassion is worth the modern Christian’s consideration. I try to be respectful of how others choose to interpret the faith, but personally I find the rejection of magic to be childish. There was a bible verse I was trying to find today, and in looking it up I made the foolish mistake of reading the comments section on a religious article. “Why do people need a bible verse to convince them to do the right thing?” a commentator asked. I don’t think people need bible verses to make good decisions, however I have noticed the right verse can do wonders towards pushing me in the right direction. For example, U.S. Supreme Court Justice Antonin Scalia died today. To put it mildly, I was not a fan of Justice Scalia’s work on the Supreme Court. I disagreed with a number of decisions he made over the years. One could go so far as to call him an enemy of mine, since he fought on the opposing side of political battles that meant a great deal to me. But today on my social media accounts I was bombarded with “thanks for the empty seat” sentiments and “ding dong the witch is dead” memes. Something about it didn’t sit right with me. I couldn’t find the words to describe what felt wrong. So I found something else to push me in the right direction. 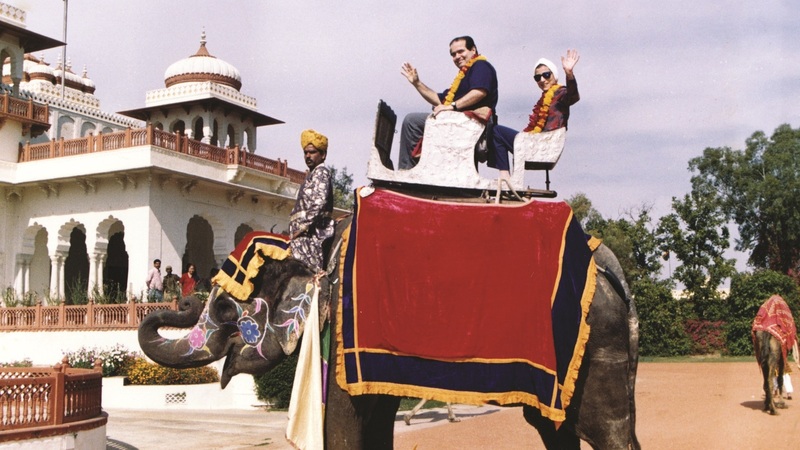 Ginsburg and Scalia ride an elephant in India in 1994. The verse is a bit different in Matthew and Luke, but the sentiment is the same: There’s no virtue in only showing love to people you already like. It’s easy to love people who love us. It’s easy to like people who agree with us. Being nice back is not a struggle, it’s our natural human response. Everybody does it. I’ll bet the same people posting memes now will call Ruth Bader Ginsburg a natural treasure when her time comes. And while I’d say she is, so was Scalia. Because both have spent lives in service to a country they loved, speaking and writing intelligently on matters they cared passionately about. Perhaps it is no surprise that they were such good friends.